Son of Deborah Muller Bunke ’69 passed away. Mr. Seth James Bunke, 32, of Jacksonville, North Carolina was called home to be with his Lord and Savior Jesus Christ on Saturday, July 11, 2015. 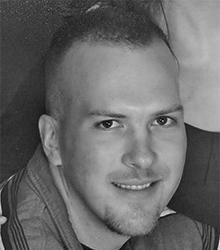 Seth was a decorated Marine combat veteran who served his God, Country, and Corps during Operation Iraqi Freedom. He also served on the staff of Centerview Baptist Church of Jacksonville, North Carolina. Seth particularly loved to serve Christ and His church through his talents related to operations of the church website, sound, lighting, and multimedia ministries. He was instrumental in helping to plan and design those ministries in the church’s new sanctuary which was completed in 2013. Seth is survived by his beloved wife, Jessica Lauren Bunke; their two precious children, beloved son, Jonah Michael Bunke and beloved daughter, Addilyn Brooke Bunke. He is also survived by his dear parents, Jim and Deborah Bunke and his sweet sister, Erin Bunke; parents-in-law, Michael and Diane Schwalm, and many other dear family members and friends. He was preceded in death by his beloved sister, Brooke Sampson, the namesake of Seth and Jessica’s daughter Addilyn Brooke. Seth attended Toledo Central Catholic High School and played on the varsity basketball and football teams. His military medals, decorations, and awards earned during his service as a United States Marine from 2002-2005 include: The Combat Action Ribbon (Iraq), Global War on Terrorism Service Medal, Global War on Terrorism Expeditionary Medal (Iraq), Sea Service Deployment Ribbon, National Defense Service Medal, Presidential Unit Citation-Navy, and Rifle Qualification Badge (Expert, 2d Award). Family visitation will be held in the sanctuary of Centerview Baptist Church of Jacksonville from 6:00-8:00 p.m. on Wednesday, July 15, 2015, and a celebration of life service, officiated by his father in-law, Dr. Michael Schwalm, will also be held at the church at 12:30 p.m. on Thursday, July 16, 2015. Interment, with full military honors by the United States Marine Corps, will follow at the Coastal Carolina State Veterans Cemetery at 2:00 p.m. While flowers are welcomed, some may choose instead to make a donation to help support Seth’s wife and children. Checks can be made out to Centerview Baptist Church, 1165 Piney Green Road, Jacksonville, NC 28546. A Memorial Service may be scheduled at a future date in Seth’s hometown of Toledo, Ohio. Arrangements by Johnson Funeral Home, Jacksonville. This one was for the 2014 Newsletter – not sure how it came to us so late? ’65 – Szykowny, Suzanne Crippen – My husband and I were just presented the 2015 Bravo Award by Opera Guild of Dayton for longtime/sustained and significant support. Reply about retirement: I am on the Boards of Opera Guild of Dayton and Dayton Philharmonic Volunteer Association. My husband and I teach and take classes at Lifelong Learning at Univ of Dayton and University of South Carolina. I sing in our church choir. I am also doing extensive research on my German Heritage. I am studing German. We both volunteer at St Francis of the Sea Thrift Shop. ’67 – Veitch, Sandy Collier – Downsized again and moved to be closer to sons and their families, who both moved to NC. Have 2 beautiful granddaughters who are 3 & 4. We live 1 mile away from the Sister of Mercy Convent in Belmont, NC. Reply about Retirement: Retired RN. Still an “active” watercolor artist and Master Gardener. ’69 – Lehr, Deborah VanLandingham – Both husband and I are retired and we’re loving it. We have 2 grown children and 1 dog. I retired from the Navy Nurse Corps. Reply about Retirement: Rest & Travel, Ministry. 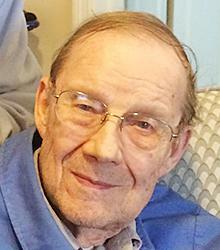 Edwin F. Petsche, age 86, passed on to life everlasting surrounded by his wife and family on Saturday, July 4, 2015. Mr. Petsche, a lifelong Toledoan, retired from White Westinghouse where he worked as the appliance service manager for over 30 years. Ed served in the United States Marines as a reservist and was called to active duty during the Korean War. He was presented a purple heart for wounds received at the Battle of the Chosin Reservoir by Senator John Glenn in 1995 at Korean War Memorial dedication in Washington D.C.
Mr. Petsche was an accomplished singer, having performed with Charlie Spivak Orchestra in the early ’50s. Throughout his lifetime, Ed continued to sing in church, at weddings, and social gatherings. A devout Catholic, Ed and his wife, Angela, were one of the founding families at St. Patrick’s of Heatherdowns Church where he served on Parish Council, Religious Education, Choir, Lector and Lay Communion Distributor. To his family, Ed was a devoted husband and father who lived his faith out every day in both word and deed. Up until his final breath he would say to his wife, Angie, “You are my life!” He lived those words every day of their 62 years of marriage and was a devoted father, providing for his family, leading them in prayer and example, and was the family enthusiast who made ordinary life events special. Mr. Petsche is survived by his loving wife, Angela (Heintschel) Petsche; son, Gary (Beth) Petsche; daughters, Ruth (Mike) Rankin and Diane (Bob) Spencer; grandchildren, Shawna, Lisa, Jake, Hannah, Joanna, Katy, and John and great-grand-children, Ashley, Emily, Hunter, Micah, Hailey, Abby, Jackson, Graham, Mabry, Kate, Audrey and Espn. In addition to his parents, he was preceded in death by his brother, Frank. Geraldine “Jeri” Nachazel, 85 of Toledo, passed away Friday, July 10, 2015, surrounded by her loving family at the Hospice of Northwest Ohio in Perrysburg, Ohio after a long courageous battle with cancer. Born February 2, 1930, in Toledo, Ohio she was the only child of Richard and Ruth (Siegler) Olson. Jeri graduated from Scott High School and attended The University of Toledo. Jeri married William “Bill” Shea who preceded her in death in 1972. 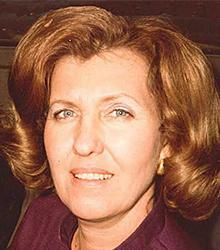 Jeri married H. Robert “Bob” Nachazel on June 20, 1975; he preceded her in death in 2008. She worked alongside her husband, Bob at Great Lakes Piano Co. for many years before their retirements and sale of the business in 2002. A selfless woman, Jeri was devoted to her family, often preparing gourmet meals and taking care of any family member in need. She was a gifted painter and enjoyed working with ceramics. Jeri’s favorite pastimes were traveling in Europe and vacationing in Glen Arbor, Michigan. A loving wife, mother, grandmother, and great-grandmother, Jeri is survived by her children, Pamela Shea Croy, Shannon Tise, Mary Pat (Neil) Witmer, Bob (Kathleen) Nachazel, Katie Kinsey, Gretchen (Nicole) Nachazel; daughter-in-law, Sue Shea; grandchildren, Corey (Hollee) White, Alexandra Bilbrey, Avery Elliott, Justin Tise, Paige and Hallie Witmer, Nathan and Zechariah Nachazel, Ian and Kyle Kinsey, Emily and Ethan Hines, Matthew (Ashley) Shea, Andrew (Diana) Shea, Phillip Rice III, Maria Rice; great-grandchildren, Sean and Emma White, Kayleigh Elliott, Will and Elle Shea, Abby and Harper Shea, and very good friend, Marcia Ruegsegger. In addition to her husbands, Jeri was preceded in death by her son, Michael Shea; daughters, Grace Hines and Linda Rice; son-in-law, Tom Tise; granddaughter, Katie Shea. Friends may visit at the Coyle Funeral Home, 1770 S. Reynolds Rd. on Sunday, July 12, 2015, from 4-8 p.m. Funeral services will be held at the funeral home on Monday, July 13th at 11 a.m., followed by the interment in Toledo Memorial Park Cemetery in Sylvania, Ohio. Memorials may take the form of a contribution to Hospice of Northwest Ohio or to the donor’s choice.